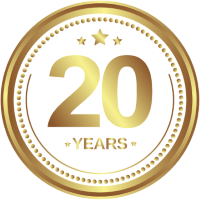 Skyline has been helping hundreds of thousands of individuals, businesses, and schools with all their binding, laminating, and paper handling needs for over 18 years. With our warehouses and service technicians all across the Nation, we have the products you need with the professional service you deserve. With thousands of items to choose from, we are ready to help you find exactly what you need. We carry equipment from dozens of brands including GBC, Rhin-O-Tuff, Swingline, Renz, MBM, Akiles, Tamerica, and many more. Our friendly and knowledgeable team is ready to answer any questions you have and find or customize the items you need at 1-866-455-9900. We accept Purchase Orders from Schools, Businesses, and Government agencies. Need a repair? Visit our Nation Wide Repair page to talk to one of our Specialists or schedule a service for your machine. 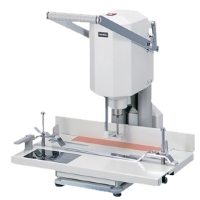 Coil Binding Machines punch round or oval holes for easy use with coil binds. The coils spiral into the bind, and are then crimped to provide a great looking presentation that can lay flat or wrap back around on itself. 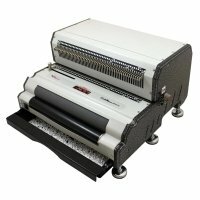 Comb Binding Machines punch rectangular holes that are used with plastic comb binds to bind documents. If you're looking to have your book spine labeled with text and/or a logo, this is the binding style for you. Wire Binding Machines punch square holes that wire binds slide into and then bind by crimping the wire into a round shape to finish the bind, producing a very classy look. Comes in 2:1, 3:1, and duo styles. Velobind Machines punch small round holes that the velobind strips are inserted into. The bind is then fused together using heat to provide a strong and secure bind, making them perfect for law & legal environments. Interested in binding more than just one style? 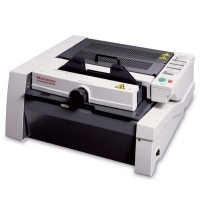 Use one of our modular or combination binding machines! 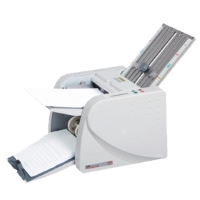 These units give you the ability to do up to +4 different binding styles with one machine. Looking for a thermal or perfect bound book? We have the machine you need for binding your own complete books, as well as the thermal glue each machine uses. Booklet staplers use staples to bind sheets together. This makes them a fast and effective way to bind booklets up to 20-40 pages. 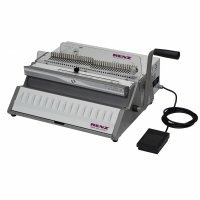 We also carry wire stitching machines for binding up to about 60 pages. For binding on the go, or having easily editable documents, GBC Proclick is a great solution for documents up to around 100 pages. Economical and efficient for office or personal use. 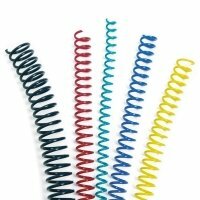 Coil binds come in a wide variety of colors, and can bind standard and custom sized documents very easily. The bound books can wrap fully back around on themselves. 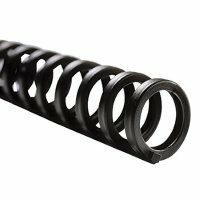 These are also known as Spiral Coil Binds. 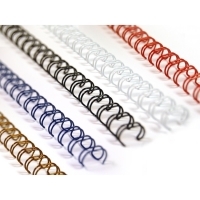 Comb binds are popular with offices and schools due to their editable binding style. 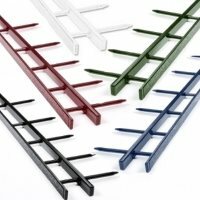 Customizable with colors, text, and logos, our combs can bind up to around 450 pages. Wire Binds (aka Wire-O) have a very professional look when bound. They come in 2:1 and 3:1 pitch for binding small, medium, and large books. Wire binding allows full wraparound of pages as well. 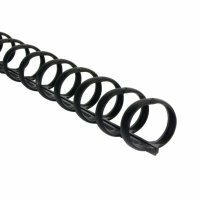 Velobinds are the choice for law & legal offices, as they provide a secure bind that prevents tampering. Velobound books can't lay flat open, which helps to keep your information safe from prying eyes. Binding covers come in solid and clear styles. WIth dozens of materials, textures, and styles, we carry the covers you need to have a professional look and feel. Want a custom cover? We have you covered! Our index tabs (aka folder dividers) come pre-printed, printable, and custom varieties. 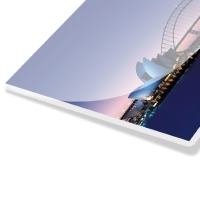 Mylar and uncoated styles are available in the bank size (# of tabs) you need, even custom tab designs! Pocket folders are perfect for custom presentations and handouts. We can custom print, cut, and style them to your liking with business card slits, disc slots, emboss, deboss, and anything you need. 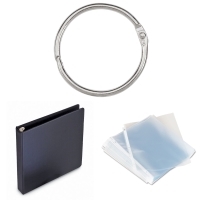 Ring binding includes our 3-Ring Binders, loose leaf binding rings, sheet protectors, and more. All standard stock options and custom binders are available for your ring bound items. Thermal binding uses heat along with glue to fuse the pages and cover together. The covers are available in hard, soft, and custom cover styles. 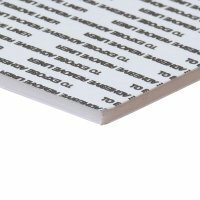 View our selection of glue strips, adhesive chips, Fastback strips, heat-resistant clear covers & more here. ProClick binds/spines are designed for easy binding and editing, as they simply 'click' together. 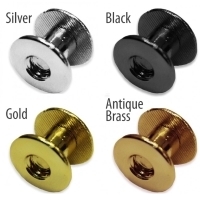 We carry the three sizes (5/16", 1/2", 5/8") in black, navy blue, white, and frost. Designed for use with any 3:1 punched sheets and covers. ZipBinds operate similar to ProClicks in how they operate, and they're designed for use with comb punched style (19 hole) documents. To bind, simply punch your covers & paper, insert the ZipBinds, and run your fingers along to close them. Screw Posts make binding swatch books, albums, and loose pages easy. One piece slides through the pages, and the other screws on to the end to finish the bind. Various colors, lengths, and extensions give you plenty of options to choose from. 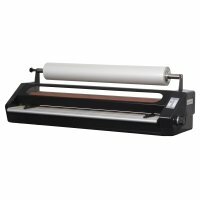 These laminators use rolls of lamination to laminate items like documents, photos, signs, and much more. Roll style laminating lets you do custom sizes and even multiple pages at once, making them popular with offices and schools alike. 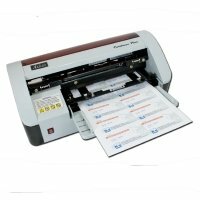 Pouch laminators use pre-cut pouches instead of a roll. With dozens of pouch sizes available, you can get the ones you need and then place them into the pouch laminator for no-trimming-needed finished documents! 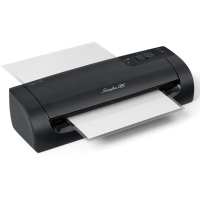 Mounting laminators are designed to laminate signs, posters, and other items that require a thick backing. 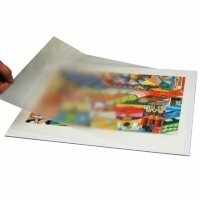 They use mounting boards and pouch boards to protect your material and give it a professional finish. 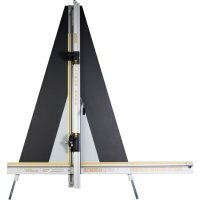 Need to trim your laminated materials? 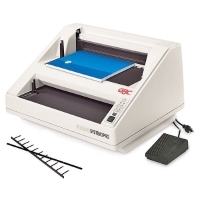 Use a lamination trimmer and you'll have quality trimmed items in seconds. 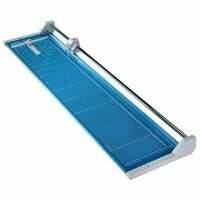 Available in both rotary trimmers and board cutter styles, we have a great laminate cutter for you. 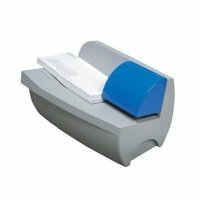 This roll lamination is used by offices and schools to protect everything from photos, documents, signs, and dozens of other items. 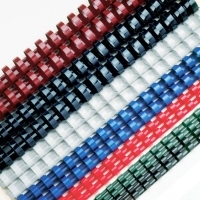 We carry all lengths, sizes, and thicknesses so you can choose your favorite. 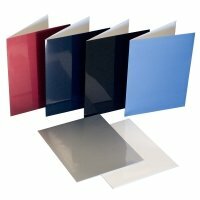 These pre-sized and cut pouches come in many standard and special sizes for quick laminating. To use them, simply place your material inside, run them through your pouch laminator, and voila, you have an amazing finished product. 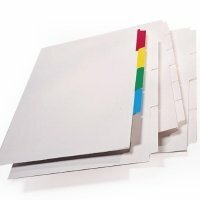 Pouch boards are similar to regular pouch lamination, except they have a foam backing. This gives a nice rigidity for signs, posters, maps, and much more. Take your pick of gloss, satin, and matte finishes. 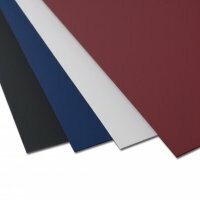 Mounting supplies include mounting foam boards, mounting adhesive, and accessories for cutting and hanging the materials. 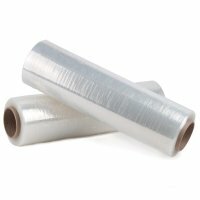 We carry both pressure sensitive and heat activated adhesives. 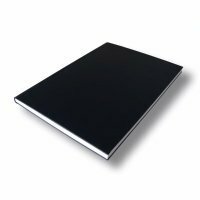 When you want to bind booklets, you'll find our booklet makers will provide the speed and quality you need to produce finished booklets. 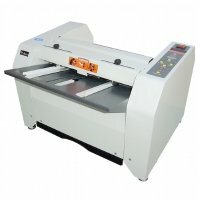 Staple and wire-stitched type machines are available, so you can choose the style that you prefer. Collating paper by hand is a slow process. 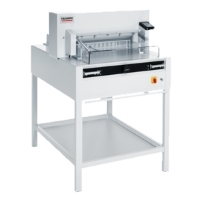 We carry manual and electric machines that will greatly increase the speed and accuracy for worry-free collation. Whether you're looking for standard collation or special orders, we have you covered. Paper joggers vibrate pages so they align perfectly. When used with printers, padding presses, and other machines, they greatly reduce the amount of mis-feeding, tearing, and machine malfunctions. Paper folding has never been easier or more accurate. 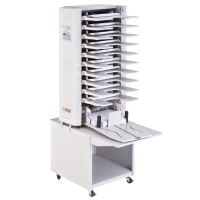 With Skyline's folding machines, you can fold thousands of sheets in mere minutes. Custom programming, air-fed, and fully automatic operation are just a few of the options available. Paper drills are one of the fastest ways to put holes in paper for ring binding and other similar types of binds. Electric and hydraulic operation makes drilling efficient. Single, dual, & three-spindle drilling heads are adjustable and many models come with foot pedal operation. Many businesses overwhelmed with mail have found letter openers to be a massive help. The electric operation opens up to tens of thousands of envelopes per hour for ultimate efficiency. 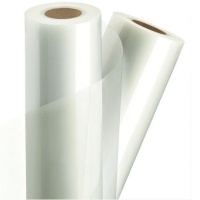 Almost every business that sells a product uses shrink wrapping. We carry a quality selection of machines and shrink wrap to choose from. All-in-one, combination, L-bar, shrink tunnels, and other machines help produce professional looking products in seconds. Padding presses are designed to align and compress sheets of paper for gluing. 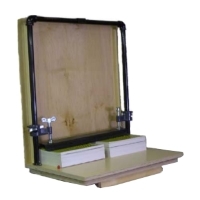 Often used to make customized notepads, order sheets, and form pads, these padding presses come in various widths and heights for all kinds of paper shapes and sizes. 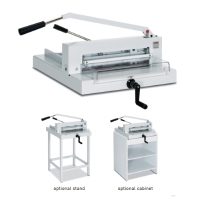 When you need to perforate, score, or crease paper & card stock materials, you'll find these machines to be a life saver. Both manual and electric styles are available to choose from in a variety of sizes. Get yours today! 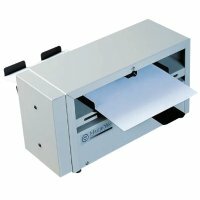 Guillotine paper cutters use a blade that swings down to quickly cut through single or multiple sheets of paper. 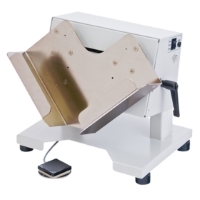 We have desktop and stand-mounted guillotine trimmers for all kinds of paper processing environments. 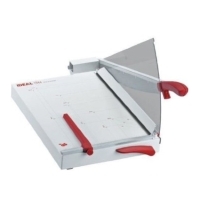 Rotary paper trimmers use a circular blade that runs side to side to accurately and safely cut paper. This makes them a popular choice for schools and offices alike. From desktop to floor models, we have the rotary cutter for you! 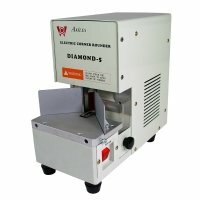 We carry all the trimming blades and cutting knives to keep your machine running. From the smallest rotary trimmer to the largest ream cutting blades, we have it all. 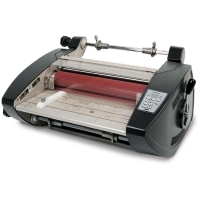 Manual HD paper cutters are also known as manual paper ream cutters, due to the amount of pages they can cut at once. Using a lever, these machines clamp and cut thousands of sheets per hour with ease. 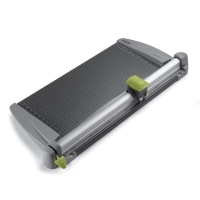 For the ultimate paper cutting efficiency, you'll find our electric HD ream cutters to be a top-of-the-line solution. Machine features range from laser guides, adjustable gauges, automatic clamping, & much more. 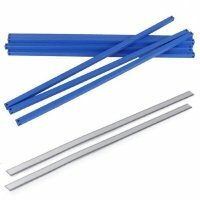 Replacement cutting sticks and mats are essential for ensuring a clean, precise cut. They provide a resilient backing that makes trimming easy. Once one section is worn out, they can be rotated & flipped for even more use! Business card slitters / makers are used to rapidly cut paper into the proper size for business cards. Manual and electric machines can produce hundreds or thousands of cards per hour. 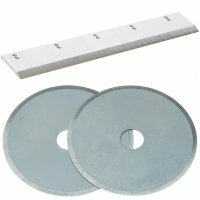 Board cutters come in many sizes and cutting capabilities. We carry models for cutting through paper, glass, plastic, cardboard, foam board, thin metals, and other substrates. When you want to put a nice rounded corner on something, we have you covered. Whether you're rounding business cards, index tabs, pictures, lamination, or similar materials, you'll find our manual and electric corner rounders to be a reliable solution. 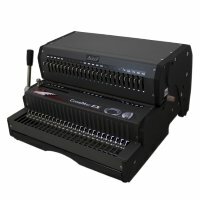 Looking for a compact shredder for use by 1 or 2 people? 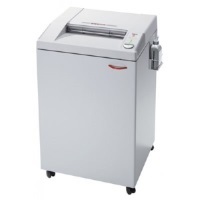 Personal paper shredders can be put almost anywhere, and provide immediate shredding capabilities for paper, credit cards, and some models can shred DVDs as well! 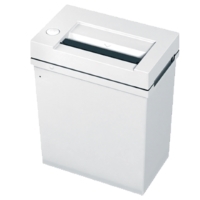 Office paper shredders are designed for use by multiple people (hence the name). Whether you're looking for a strip cut or cross cut shredder, we have the quality shredder you need. These heavy duty shredders are built for the toughest materials and highest quantity operations. We have industrial top-load and conveyor fed models, with high quality safety features to ensure worry-free operation. 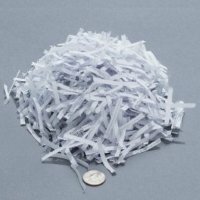 When you need absolute, top of the line security, you'll find these shredders to be the perfect solution. 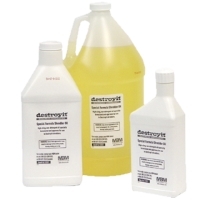 With cross and micro-cut shred styles, the shredded material is unrecoverable and safe for disposal or recylcing. Looking for a shredder that matches your department's requirements? 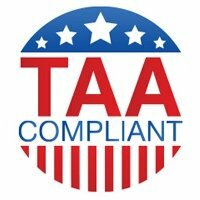 Choose from our TAA Compliant, NSA/CSS, DOD, FBI, and DOJ approved shredders. 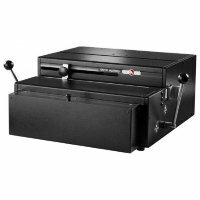 Shredder supplies and accessories include shredder bags, oil, collection carts & consoles, and other items for smooth, reliable shredding. We carry all sizes and quantities, and will be happy to get you anything you are looking for. 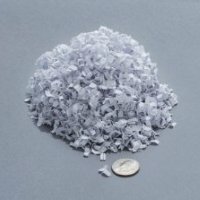 Strip cut shredders use blades that cut the paper into long strips. 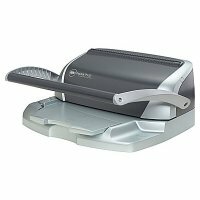 This makes them operate much faster than cross or micro cut, and is a great choice for routine shredding of paper with staples, paper clips, and credit cards. 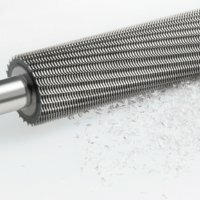 Cross cut shredders use blades to cut the paper into short strips of paper, making them more secure than strip cut, while also being faster than micro-cut. 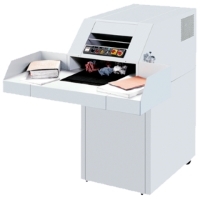 This provides a nice balance of security and shredding capability. 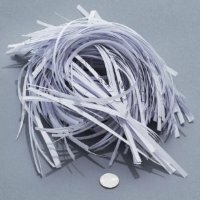 Micro cut shredders use blades that turn the paper into tiny pieces of paper, making them the best choice for security. They take fewer sheets at a time, and make any sensitive info unrecoverable.